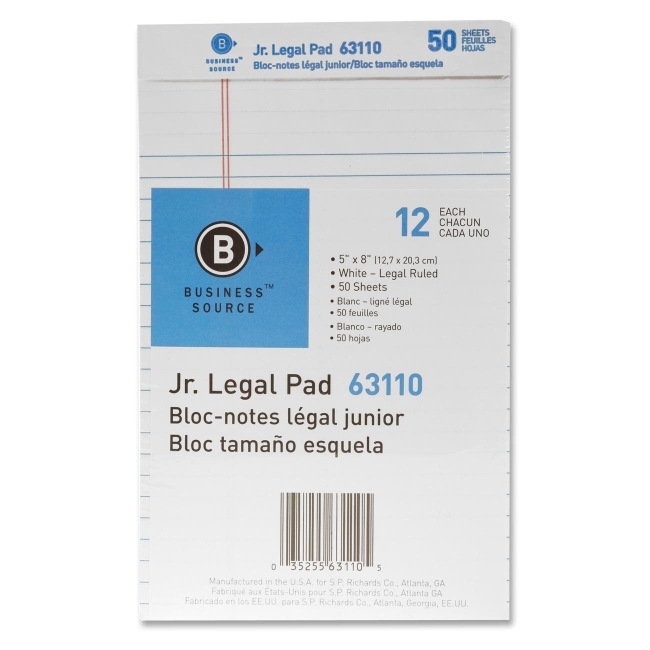 Media Size: Jr.Legal 8" x 5"
Legal-ruled pads feature microperforated sheets for clean tear-out and sturdy, 30 point chipboard backing. Each pad contains 50 sheets of 16 lb. paper. $23Tops Glue Top Narrow Ruled Legal Pad - Letter 8.50" x 11"
$29Sparco Gray Legal Ruled Pad - 8.50" x 11.75"
$34Tops Prism Plus Chipboard Back Legal Pad - 8.50" x 11.75"
$30Sparco Orchid Legal Ruled Pad - 8.50" x 11.75"
$25Tops Docket Wirebound Legal Writing Pad - 8.50" x 11.75"
$3Sparco Premium Grade Perforated Legal Ruled Pad - 8.50" x 11.75"